How to Add Mashable Style Social Subscribe Widget for Blogger. How to Get High Number of Subscribers on your Blog. 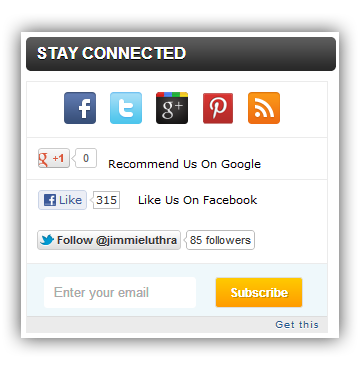 This Widget contains following subscribe options, It has a Beautiful bar with social icons like Facebook page, Twitter page, Google plus, Pinterest, RSS. Here are the steps to Add the Widget to your Blogger Blog. Step 4: Copy and Paste the following code inside the window. Step 5: After Adding the code inside the window, Make the following Changes. Step 6: Now click Save. Hope you guys liked this tutorial, Please share this post and leave your comments below.